A unique his & hers style, this Handcrafted wedding band set features a double braided men's and single braided ladies' ring. Hers ring has a single center braid and rounded edges. 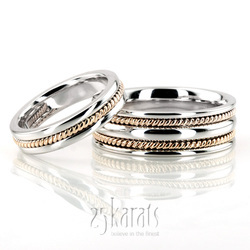 His ring has a convex center piece with small braids on each side. Both bands are high polished. Total Gram Weight*: 22.61 grams.